The passenger train plying from Anuradhapura to Matara was derailed between Sinigama and Hikkaduwa a short while ago. Five passengers are reported to have been killed. The injured have been rushed to the Karapitiya hospital, sources said. The advancing Security Forces took total control over the entire Mannar 'Rice Bowl' area this afternoon (June 29), denying terrorists its main and heavily fortified defences at the Mannar front after days of heavy fighting ensued between troops and LTTE. The capture of this area stands to be a significant breakthrough made by the security forces following the liberation of Periyamadhu area from LTTE on 26th June. According to military Spokesperson Brigadier Udaya Nanayakkara, the total area brought under control is approximately 120sq.kms, which mainly consists of the Island's most fertile paddy fields. In 1991, farmers have gathered a record-breaking paddy harvest from this area; the Spokesperson said adding that the famous 'Giants Tank' itself provides water to 153 small irrigation lakes. Manthai, Manthottam, Adampan, Pallekuli, Kurukkandalkulama, Vellankulama, Vadakkandal, Alankulama, Andankulama, Marattikannadi, Alakaddiveli, Parappakandal. Parappukadatan, Tenveddiyan, Minukkulama, Vilayankulama, Papamoddai, Odduppalan, Kuruvil- Sluice, Neduvarampu, Kannaputtukulama and Vannakulama, were the main areas that was liberated by the security forces as troops are said to have consolidated and poised within striking distances to LTTE's strategically important coastal stronghold in Veddithalthivu. Further speaking to defence.lk, Brigadier Udaya Nanayakkara said that, the capture of the Mannar 'Rice Bowl' and adjacent areas has denied the LTTE 12km of the A-32 Mannar- Pooneryn main road, in addition to the Uyilankulama - Adampan and Uyilankulama - Andankulama main roads, considered to be LTTE's main supply routes from the North. The LTTE terrorists have also lost 13km of coastal stretch in Mannar, he further said. The Sri Lankan Army infantry, armour and artillery troops mounted decisive attacks at LTTE positions inflicting heavy damages to the terrorists during the counter terrorist operations launched, with tactical fire support provided by the SLAF helicopter gun-ships, security sources said. The Government will open the new Arugam Bay bridge connecting Pottuvil, Arugam Bay and Panama in the Eastern province, to the public today (June 30). The bridge constructed at a cost of US $ 10 million, will replace the old bridge over Arugam Bay which was severely damaged in the 2004 Boxing Day tsunami.The United States Agency for International Development (USAID) has provided financial assistance for the construction of the new state-of -the-art bridge which has been designed and built according to US technology. According to the Highways Ministry, the new bridge which runs parallel to the old one, comprises two spans measuring 185 metres, and offers user-friendly features like protected pedestrian walkways. The project launched in August 2006 also includes 900 metres of paved access roadway and a water supply system for Arugam Bay. "We hope that the project will be a major boost for the fishing, agriculture and tourist industries in the areas and thus help the revival of the economy in the East," a Ministry spokesman said. The LTTE suffered heavy defeats with soaring casualties as the outfit lost almost all the bases within the Mannar 'Rice bowl' area with the fall of Andankulama in Mannar to security forces yesterday(June 27), military sources report. According to Military Spokesperson Brigadier Udaya Nanayakkara, 11 terrorists were killed in addition to 3 soldiers who were said wounded during the confrontations at Andankulama. Troops have also gained full control over 13 square kilometers surrounding the Andankulma area, sources further said. Also, the advancing Army battle formations have inflicted decisive blows to LTTE during multi-pronged attacks launched at LTTE fortified defence lines in general area Papamoddai, as troops confirmed at least 21 terrorists were killed in the confrontations. According to defence sources, pitched fighting were reported in Papamoddai and Neduvarampu general areas since 8a.m., which lasted till 4p.m, on Friday. 3 soldiers have received injuries, while military claimed to have uncovered another slain LTTE body along with a T-56 assault riffle following a search operation conducted in the area. Pressure is mounting on the Government of Sri Lanka to appoint a commission to investigate into the killings of 37 elected members of Parliament of Sri Lanka, starting from the murder of Alfred Duraiyappah on 27 July 1975, up to that of the slaying of Minister Jeayaraj Fernandopulle on 06 April 2008, in a bomb blast in Welliweriya. Alfred Duaraiyappah, who was a Member of Sri Lanka Parliament and Mayor of Jaffna was the first MP to be killed by the suspected Liberation Tigers of Tamil Eelam. Though the case regarding the killing of Alfred Duraiyappah was taken up for hearing and judgment was delivered, it is suspected that the actual killer was not brought before any court of law in Sri Lanka. In fact, V.Prabakaran, the leader of the LTTE, proudly claimed that he was the one who killed Alfred Duraiyappah, and he remains at large. Unfortunately up to now, there is no way either to confirm or dismiss the claim of the Tiger leader about the killing of Alfred Duaraiyappah. Dr. Keheliya Rambukwella when talking to Asian Tribune said that he intends to take up this issue with the Government of Sri Lanka for the setting up of a Presidential Investigative Commission to go into the killings of 37 former Members of Parliament who represented the people of this country one time or more in their life time. National Freedom Front, newly setup political party of Wimal Weerawansa could attract more JVP parliamentarians.Anjan Umma MP is the new member who obtained her membership in the party today morning at the NFF headquarters, Pelawatta. Wimal Weerawansa General Secretary of the NFF said he invites all JVP parliamentarians to join with the NFF to make a good political culture. At present 12 JVP parliamentarians are with Wimal’s group and another few MPs are expected to join with them, said political sources. NFF is the forth largest party at the Parliament today and Wimal Weerawansa could attract more members for the party, said a political analyst. Meanwhile JVP Leader Somawansa Amarasinghe said Anjan Umma’s case is second stage of one episode. The Sri Lankan Army infantry and armour divisions stepped up ground advances backed by heavy artillery into South of Papamoddai and areas East of Marattikannnaddi and Minnaniranchan in Mannar since 6 a:m last(June 26), morning. According to latest reports 12 LTTE terrorists were killed during the fighting ensued between troops and LTTE. Further, 1.7Km stretch between Chalampan and Marattikannadal along the Andankulam- Vidattalativu road was brought under full control of the army troops, the report said. SLAF striker helicopters have also supported with tactical fire support during precision raids launched North of Andankulama this morning at identified LTTE positions ahead of the existing FDLs. Papamoddai is located 12 km. south of Vidathaltheevu and 8 km north of Mannar, on the Mannar-Pooneryn road. According to available information heavy fighting was reported between troops and LTTE in separate locations South of Papamoddai as ground troops claimed to have chased off LTTE flanks sent to defends its last lines of defences in the area, which is said strategically important considering its proximity to LTTE's coastal stronghold Veddithaltivu. Sinha Basnayake, a former Director of Legal Affairs at the United Nations, has been named as part of a panel to examine whether any United Nations staff should be held individually accountable over last December’s deadly terrorist attack on the world body’s premises in Algiers. UN Secrertary-General Ban Ki-moon told UN staff that he was establishing the follow-up group in response to a recommendation issued by the Independent Panel on Safety and Security of UN Personnel and Premises Worldwide, itself created in the wake of the Algiers bombings, which killed 17 staff members and targeted UN offices in the Algerian capital. Ralph Zacklin, a former Assistant Secretary-General for Legal Affairs, will head the group, and he will be assisted by Jean Jacques Graisse, Sinha Basanayake, Zelda Holtzman and Marisela Padron. The team will work out of UN Headquarters in New York and is slated to report back to Mr. Ban within six weeks. In his letter to staff, the Secretary-General stressed that he has not forgotten the sacrifice of those who lost their lives in the Algerian capital, or the suffering of the many other victims or their families. "I would like to reiterate my firm commitment to ensuring full accountability on the part of my senior managers, as well as all those at other levels of responsible decision-making," he said. "But, combating security threats from terrorists and other detractors of the United Nations and ensuring the safety and well-being of staff and dependents, national or international, makes it incumbent that host governments and Member States also realize their responsibilities more strongly so that fuller and more concrete cooperation of security matters can be elicited from them. This factor cannot remain under-emphasized." The Independent Panel, led by Lakhdar Brahimi and comprised of international experts in the field, presented its report to Ban earlier this month, and the report was released today with some redactions to avoid revealing details that may pose further threats to the personnel and premises of the Organization. Sri Lanka Air Force fighter jets and MI 24 helicopter Gunships carried out two air raids targeting LTTE camps located in the North Mannar this morning (June 26). According to the Air Force sources, the first raid was carried out by MI 24 helicopters at 6 am targeting a Forward Operating Base (FOB) of LTTE located at Marattikannadi , 2 km North of Andankulama. The air raid was carried out to support the ground advance of Army 58 division on the Mannar front, said the sources. Ground troops have confirmed that the attack was effective, the sources added. The second air raid was carried out by Air Force fighter jets around 6.10 am targeting a training base located in the Vellankulama area , 20 km North of Vidattaltivu. According to the sources the target was accurately taken. Exact damage caused to the enemy in this attack is yet to be verified, said the sources. Retired Supreme Court Judge Chandra Nihal Jayasinghe is expected to take over, as Sri Lanka’s High Commissioner of United Kingdom from 1st of July. Shenuka Senivaratne, the outgoing High Commissioner has completed her tour of duty and has gone back to the Ministry of Foreign Affairs in Colombo on the 19th of this month. Supreme Court Judge Chandra Nihal Jayasinghe retired from judicial service on 01 March, after serving in the legal profession for 37 years. Primark , one of the biggest chains of low cost fashion stores in the United Kingdom had to drop three of its suppliers in India as a BBC Panorama programme exposed the supplying factories were employing Sri Lankan Tamil children in South Indian refugee camps. In the program it was exposed the subcontractors for Primark’s suppliers were employing the refugee children as slave labor to complete embroidery work. The Guardian newspaper published photos of the working children attaching sequins to a T-shirt and a model wearing a similar T-shirt. The retailing chain said as soon as it was alerted about the child labor fiasco it cancelled all new orders with factories connected with the practice and withdrew the relevant clothes from is shelves. The agitation against the practice with few demonstrations in front of the Primark shops started when reporters for the BBC’s Panorama Television programme exposed the practice. Panorama report said, after a seven months investigation, that they found three firms in Tirupur, an industrial area in Tamil Nadu supplying clothes to the British firm Primark. While the masses tighten their belts, staggering in the face of the skyrocketing cost of living, the forthcoming SAARC summit is set to cost Sri Lanka at least a whopping Rs. 3 billion, The Nation learns.According to the initial estimates drawn up on Friday, the summit, which was shifted from Kandy to Colombo due to security and infrastructure related issues, will cost the country a staggering Rs. 2,889,180, 332.The Rs. 2.8 billion estimate includes infrastructure development, accommodation, transport and decorations. The government will seek to pass the Rs. 2.8 billion as a supplementary budget at the next Parliamentary session.Sources, however, stressed that the final cost is usually much higher than the initial estimate, due to which there was a huge possibility that the total cost of the summit would surpass the Rs. 3 billion mark. Meanwhile, News-Lanka learns that apart from purchasing a large number of luxury vehicles for the use of VVIPs, the government is also spending millions to lease out vehicles for the use of other delegates at the summit. Sri Lanka is expecting around 800 to 900 delegates at the summit, with more than 150 foreign journalists also expected to cover the two-day event. Police Special Task Force (STF) commandos gunned down an LTTE cadre during a confrontation at Kaluthavalai in Batticaloa this evening (June 22). According to the defence sources, the STF personnel have launched a cordoned search operation in the area following the claymore attack that killed 2 police personnel in this morning. Charles Anthony is proven to be a psychopathic megalomaniac like his father Velupillai Prabhakaran and the senior leaders of the Liberation Tigers of Tamil Eelam (LTTE) worry about the meteoritic rise of the son. According to intelligence reports Charles Anthony has developed a new chemical weapon capable of such a shock wave that could kill, permanently damage vision and hearing and also make women barren. "Now that the war is in the northern theatre, use of this lethal weapon could make the Tamil women barren and reduce the birth rate in a drastic manner," an analyst said. "Father used to kill the innocent Tamils and other civilians. The son has now gone a step further. He is determined to make the Tamil women – mothers, daughters and sisters barren. - Chip of the old block"
Sources revealed that Charles Anthony developed his crude Improvised Explosive Devise (IED) as answer to LTTE’s plan to stop the troops from marching into Vanni. Latest military reports revealed that Sri Lankan Government forces have started surrounding the LTTE’s Vanni stronghold, and menacingly advancing into the Tiger power centre. This situation has made them to realize that the 122 MM big guns of theirs has become something of an inappropriate lethal weaponry to rely of, as the enemy is so close and near, unable to fire effectively with a firing range of 25 KM. When the inability to stop the advancing forces became a life and death issue, heir-apparent Charles Anthony, it is said, has come up with two Improvised Explosive Devises Sandai 500 Kg– (Fight) and Samathanam 500 Kg (Peace). News-Lanka learnt that these two new Improvised Explosive Devises are not something new, but yet another version of the “Pasilan 2000” of the 1990s, the home made explosive type used to threaten the enemies with a loud explosion. The sound when exploded is heard for a long distance and those in close proximity have been affected with their hearings and also it was told that blood used to ooze out from the ears of the enemies when this crude devise explodes. Pasilan 2000 had a range of 200 meters. Pasilan 2000 was introduced in the LTTE military hardware, known as a mortar or artillery, like the 122mm canon, successor to the ‘Baba mortar’ used by the LTTE for ground operations in the late 1980s. However the two newly devised explosives are said to be capable of carrying a war head weighing 500 Kg to a distance roughly to 1 Km against that of 200 meters of Pasilan 2000. Experts revealed that casing of these two explosives are cast out of aluminium metals and it has a tendency to melt and when it lands it looses force and cracking down is limited against TNT grenades made with the iron casings. On trial explosions it became apparent that many pregnant women within a radius three kilometres aborted on the on the peculiar loud noise of the explosion, and the doctors in the Vanni have warned that explosion of these two crude explosives - Sandai and Samathanam would cause permanent barrenness in the midst of women. Though the after-effects of this crude explosive devises are alarming, but the heir-apparent has ordered the field commanders to use this dangerous explosive in the battle field. He also had told that the women cadres in the field to be withdraw to three to three four KM before theses explosives are fired. Though women cadres might have very remote chances of being saved, but the plight of women in Vanni faces the danger of turning barren in the near future. Sources also revealed that senior leaders of the LTTE have expressed concern over Prabhakaran’s overt and covert strategy of promoting his son over above the seniors who sacrificed the entire youth for the movement. “Soosai, Bhanu, Baby Subramanium, Illantherian and many others are worried about this development,” the source said. “They argue that Charles Anthony lacked experience to take such a senior position and his inhuman methods could be harmful to the image of the LTTE, which is currently trying to whitewash its image keeping in mind the international community. Even (Intelligence Head) Pottu (Amman) has warned Prabhakaran against giving too many responsibilities to young Charles Anthony,” he said. A high-powered Indian delegation headed by National Security Advisor M.K. Narayanan arrived here Friday, with Indian and Sri Lankan sources giving different accounts of their mission. Accompanying Narayanan were Foreign Secretary Shivshankar Menon and Defence Secretary Vijay Singh. The three officials between them virtually determine India’s policy vis-a-vis Sri Lanka. The South Asian Association for Regional Cooperation (SAARC) summit is scheduled to open Aug 1 in Colombo. “The delegation is scheduled to meet President Mahinda Rajapaksa and other key government officials”, the source said, declining to give further details about the previously unannounced trip. When contacted, a top official of the Presidential Secretariat played down the importance of the visit, calling it a “regular one”. “Their visit is a part of the ongoing consultation between Sri Lanka and India on the current developments,” the official said, in an obvious reference to the conflict raging in Sri Lanka. The official pointed out that a Sri Lankan delegation comprising Defence Secretary Gotabhaya Rajapaksa, the president’s secretary Lalith Weeratunga and presidential advisor Basil Rajapaksa went to New Delhi in late 2007. Bill Gates, Chairman Microsoft Corporation during a 20 minute interview I had with him in Indonesia has assured that he would visit Sri Lanka next year, said Prof Tissa Vitharana, Minister of Science and Technology, addressing the launch of INFOTEL the biggest Information Communication Technology (ICT) event in Sri Lanka that is scheduled to be held on 30th October at the BMICH. The launch and a press conference to reveal the details of INFOTEL was held at Trans Asia Hotel last week where Prof Vitarana was the Chief Guest. He said that Bill Gates was invited to inaugurate Infotel, but he has said that he would be unable to attend, but he would send his message for the event.Prof Vitharana said that when Bill Gates comes to Sri Lanka they could make use of the opportunity to get Microsoft involved in ICT research and development and said that with the government declaring next year as the year of ICT and English and this will enable Sri Lankan children to get jobs they are looking for in a short period of time. He said that Infotel 2008 will be an ideal platform to showcase the combined strengths of the ICT industry of Sri Lanka and to pitch this message onto the international arena and it will highlight the enormous growth potential in the country and the comprehensive policies, infrastructure and conducive business environment in place to fuel and sustain this growth. Infotel aims to bring together the entire IT community in Sri Lanka including industry experts, professionals and academics and the user community to a single platform. This will be the 9th Infotel Exhibition will be held as part of the ICT Week for 9th consecutive year commencing from October 17th. The four day exhibition will be on the theme “The Future is already here”. It is expected to draw attention to the already available infrastructure and offerings in the local ICT field and highlight that human capability and broadened outlook are the pe-requisites to exploit the available facilities to its full potential. In addition to the software, hardware and communications categories, special “Career Section” will also be introduced. This is aimed to provide career seekers, students and visitors with information on how to match career and job opportunities in the field of ICT with the required academic and professional qualifications along with skills required by the industry. It will also showcase the strengths in the market in terms of academic and professional courses available.The e-Sri Lanka initiatives section will be coordinated by the ICT Agency to showcase applications that help to bridge the digital divide or remove the technological boundaries between the average citizen and state institutions. It will enable the visitors to share and be informed of e-services and solutions offered by public sector agencies to improve their lifestyles using digital technologies. Roshan Rasool,Chairman, Infotel Lanka Society said that last year was a great success and this year they want to make it the biggest ICT Week ever in the whole of Sri Lanka. Roshen Devapura, COO/Director, ICT Agency of Sri Lanka said that the government is devoting increased focus on developing the ICT and ITES sectors of the country. The 10th International IT Conference (IITC) 2008 organized by the University of Colombo School of Computing is another key event of the National ICT week. It will provide networking opportunities for participants to acquaint themselves with the current global technological developments through presentation made by eminent specialists in the field. Sri Lanka’s Prime Minister Rathnasiri Wickremanayake said the Sri Lankan government would not hold any discussions with the LTTE until they lay down their arms. He said Tiger organization is facing its biggest defeats now.The Prime Minister at a meeting with the new New Zealand ambassador to Sri Lanka Rupert Hall Biro at the Prime Minister’s office on Thursday said that the LTTE must lay down their arms before arriving at the negotiating table. The Prime Minister has reiterated that the Sri Lankan government is committed to safeguard the rights of the Tamil people. He further pointed out that the government was able to liberate the Eastern province from the terrorists due to the implementation of a systematic programme.The Prime Minister requested the New Zealand Ambassador to assist in the development of the local dairy farming. Ambassador Biro has pledged to assist Sri Lanka in the programme to eradicate terrorism. Troops deployed on the Mannar frontline yesterday (June 19) reported that 3 terrorists were killed in separate incidents. In the Nadunkandal area, a terrorist was gunned down around 12.45pm. In the Periyaoddeppu area troops gunned down a terrorist detected ahead of the defence line around 8.50am. Also, in the Mulikkandal area, a terrorist was reportedly shot dead around 11.45am. The Police is seeking public assistance in tracing the blue colour Hero Honda 100CC motor bike bearing WP UD 2643 which is believed to be used for terrorists activities in the South. The public is requested to contact the Police on the following numbers to provide any details with regard to this suspected bike: 0112662311, 0112662323, 0112685151. The Police Department is offering a reward of Rs. 1 million to anyone providing a credible clue that could lead to the arrest of the person or persons using this bike. Sri Lanka army soldiers have gunned down the LTTE intelligence wing leader of the Trincomalee South region at Manachchena, 2 km North of Pahala Thopoor this morning (June 19). According to the defence sources in the area, the terrorist identified as Soundarajan alias Thangan has been hunted down by soldiers whilst being engaged in a cordon and search operation around 9.30 am. Soundarajan was the successor of Arichchellwam who was also gunned down by army in January this year. A micro pistol, 3 magazines and a pistol pouch have been found in the possession of the slain terror leader.The sources further revealed, that the slain terror leader was the head of the special LTTE team sent to the east to disrupt the prevailing normalcy in the area. The hoisting of the Eelam falg at Milan was shown on the National Television of Itlay Rai Uno One, but this time there were no adulations about the oppressed Tamil people or of the illusory goal of Prabahkaran’s Eelam, but the TV commentator described the flag as the most dangerous flag symbolizes the most dangerous terrorist outfit of the world. Also announced that under the direction of the Interior Ministry, the anti terrorist outfit has swooped down in the wee hours in the morning and arrested 33 suspect of the LTTE. The Tamilnet official organ of the LTTE announced with rejoice the manner in which the Tamils hoisted the Tiger flag in Milan, and the city with nearly 25000 Sinhalese could not resist the power of the Tamils diaspora and it also said representative of the government with about 30 others were present, but unable to do any meaningful thing to stop the meeting. The Sri Lanka Ambassador then spoke to the commune which has granted permission for the meeting and was informed that the permission was granted to one of the Tamil Associations registered in Reggi millia who has sought permission to hold a meeting of the alleged human rights violations in Sri Lanka. Therefore they said that they found that there was nothing wrong in granting permission. The Ambassador then has requested to permit him to answer the allegations on behalf of the government of Sri Lanka. The Ambassador then informed every single police division including the Milan Police the carribinarie and the special anti terrorist division that a leaflet had been distributed showing the Eelam flag the emblem and the map and the photograph of Prabahkaran and the meeting ought to be banned. He said that there is evidence that suicide bombers have arrived in Italy and is waiting for orders and that poor Tamils are constantly complaining to the embassy about the extortion. The Ambassador assured that he has the highest respect and regard to the Italian Ministry and specifically the new minister who has publicly proclaimed that he has absolutely no sympathy for terrorists or terrorism. Prabahkaran has been elevated by the no lesser institution than the FBI as the most ruthless terrorist organization in the World. But Sri Lanka Ambassador said that he has faith in the Italian police who will ensure that such evil bandits will have not place in Italy. As a democratic country the Ambassador said that we must give them time to investigate into the complaints. 33 LTTE terrorist suspects have been arrested by the Italian anti-terrorist police during a massive country-wide counter insurgency operation conducted on Tuesday (June 17), foreign news agencies report. The 33 Tamils all from Sri Lanka were detained alleged for involving in activities and supporting the internationally banned terrorist outfit, LTTE, news sources said citing an Italian police statement. According to the sources, about 200 police personnel were involved in the simultaneous raids on suspected LTTE Tiger hideouts in eight different cities - from Genoa in the north to Palermo on the Mediterranean island of Sicily. The massive counter LTTE operation by the Italian police comes in the wake of the Canadian government's decision to list the World Tamil Movement (WTM) as a terrorist organization, under the Criminal Code of Canada on Monday (16). Three months ago the Italian authorities closed down an illegal Tamil Tiger propaganda TV channel operating from Italian territory. The LTTE is a ruthless terrorist outfit notorious for crimes against innocent civilians led by the terror psychopath, Prabakaran. In its pursuit for a mono ethnic separate homeland for Tamils since 1983, the outfit has killed and maimed over tens and thousands of innocent children, Tamils and Sinhalese political leaders in indiscriminate bomb attacks. Meanwhile, defence analysts are of the view that the intensification of anti-LTTE operations by the IC recently is a positive gesture supporting the SL government's efforts towards eradicating terrorism. The police said violent Sri Lankan Tamil gangs in South London area, where illegal fund raising activities of the liberation Tigers of Tamil Eelam (LTTE) are quite rampant are "constantly tooled up" and "ready to go", for such crimes. “There have been a number of violent clashes involving groups involving Tamil men in Croydon and other parts of south London in recent years”, said a local newspaper Wandsworth Borough News. “They culminated in the murder of 28-year-old Prabaskaran Kannan in Tooting last year. He was chased by a group of four men from Croydon who stabbed and slashed their terrified victim 31 times outside a fried chicken takeaway shop”, the newspaper reported. The crime incident came to be known as ‘Chicken Cottage Tamil Murder’ after the name of the take away restaurant. The chief detective in the case said Croydon's Tamil gangs were causing concern among officers. Detective Sergeant Mick Snowdon spoke out about the problems surrounding Tamil gangs after five men were convicted for Kannan's murder at the Old Bailey in London. Witnesses said in the courts that Kannan was heard shouting "It wasn't me, it wasn't me" shortly before he was brutally set upon and killed by the four Tamil gang members. Last week, Vabeesan Sivarajah, 22, Aziz Miah, 20, of Sumner Road, Croydon, Asif Kumbay, 20, of Grasmere Road, Purley, and Kirush Nathankumar, 18, of Purley Way, Croydon, were all convicted of murder by an Old Bailey jury. They all denied the charges. “The young men burst into tears after the sentence was announced. A jury of nine men and three women took three days to reach their verdict”, reported the local newspaper. “The four were also convicted of causing grievous bodily harm and actual bodily harm to two gang members who were with Kannan that night. “Another defendant, Mayuran Srivinayagam of Greyhound Terrace, Streatham, was cleared of murder and manslaughter but was found guilty of assault. “Earlier in the trial a sixth gang member, Mahitharn Ratnasingham, of Lesley Grove, Croydon was cleared of murder and manslaughter. He admitted assault. The men are due to be sentenced on July 7. “After the men were convicted Det Sgt Snowdon told the Croydon Guardian: "They the gangs are very violent. They are constantly tooled up and ready to go. It is almost like the level of violence is ad hoc. Whatever happens for them happens, and it depends on what weapons they have around." Quoting a businessman who runs a shop in Croydon the newspaper said Sri Lankan Tamil gangs controlled most of the crime and had the town centre on "lockdown." Police have always in the past denied there was a problem with the gangs in Croydon, but have now admitted there was a specialist officer dealing with Tamil gang activity in the borough. A member of a gang who did not want to be named said: "These guys are tough man, they do not care who they hurt or who gets in their way. They ride around in flash cars tooled-up with knives, swords, bats and whatever else they can grab to do damage to a guy." Troops operating on the Mannar front attacked 3 LTTE bunkers at two separate incidents this morning (June 16) and claimed 11 terrorists were killed and at least 2 others wounded. In the general area Southwest of Periyamadhu, troops attacked and destroyed an LTTE bunker around 9.15 am. Ground troops claimed that 6 terrorists were killed in this incident. Troops suffered no casualties. Separately, troops attacked 2 LTTE bunkers located in the Mullikkandal area around 9.45 am. Both ground troops and monitored radio transmissions confirmed that 5 terrorists were killed in this incident. Also, 2 soldiers were killed and another suffered injuries. The injured was directed to immediate medical attention. Janatha Vimukthi Peramuna (JVP) Leader Somawansa Amarasinghe has pleaded for the European Union’s Generalised System of Preferences (GSP+) trade scheme benefit during a tour he made to the United Kingdom last week, urging Britain to intervene on Sri Lanka’s behalf. JVP Propaganda Secretary Vijitha Herath told The News-Lanka that during the meeting Amarasinghe had with British Labour MP Andrew Love, who also heads the Sri Lanka Committee of the British Parliament, the JVP Leader had emphasised that if the EU were to curtail the GSP+ benefit, it would not only impact the government but also affect the people outright, especially the thousands employed in the garment industry. Amarasinghe had urged the British Parliamentarian to intervene on Sri Lanka’s behalf and ensure that the GSP+ benefit was given to Sri Lanka, to which Love had responded that although their role was very limited, the Sri Lanka Government could do “much more” to ensure that the benefit is enjoyed by the island nation.The JVP Leader’s plea comes just weeks after UNP Leader Ranil Wickremesinghe undertook a mission to the EU, where he held high-level discussions with senior officials, urging them to renew the GSP+ concession to Sri Lanka once it expires later this year. With a fresh coup attempt distressing United National Party (UNP) Leader Ranil Wickremesinghe, the seemingly nervous UNP Leader was seeing attempting to lure party members and also approaching rebel MPs who had defected to the government, promising them plum positions if they sided with him, The Nation reliably learns.Highly-placed sources, who spoke on the condition of strict anonymity, claimed that over the past week, Wickremesinghe had been having one-to-one meetings with UNP Parliamentarians to test the waters – amidst secret closed door meetings being held elsewhere, where moves to overthrow Wickremesinghe had been discussed at length. “Some 30 to 35 members are in support of the overthrow moves, but no one is showing their support in the open for obvious reasons,” the sources said. It is learnt that apart from Wickremesinghe and his close associates, even members of the government are trying to identify those who were heading the attempts in a bid to buy them over, but the adamant UNPers are insistent that they only want a leadership change, not a party change.The majority of the members who are fighting for the change have cited Wickremesinghe’s failure to take collective decisions as the main reason for the change, with the other reason being their loss of faith in his leadership. According to the sources, despite the heavy resistance given by the LTTE terrorists, soldiers who were inching towards LTTE territory captured the entire bund of the Periyamadu Tank which is about 2.5 Km long. Seven soldiers were suffered injuries during the gun battle and damages to the LTTE terrorists are yet to be known. It is a major set back to the LTTE terrorists as the security forces gained the whole tank area under their control. SLAF fighter jets launched precision air sorties destroying a key LTTE combat-logistic facility located at Venavil Southwest of Puthukkudiyiruppu in Mullaittiuvu district on Sunday (June 15) at around 10a.m. Large explosions were observed from the target site Air Force Spokesperson Wing Commander Janaka Nanayakkara said, citing fighter pilots, further adding that the facility was used to convert, maintain and service LTTE's combat vehicles. The target was acquired following constant air surveillances and continuously gathered information, defence sources said. This strategically important facility also consisted a large fuel dump, the sources added. The workshop at this site was used to modify, maintain and service combat transport vehicles for the LTTE and also believed to be a prime logistic and combat supply storage for the terrorists, the sources further asserted. Sri Lankan Foreign Minister Rohitha Bogollagama will arrive today to New Delhi to extend the formal invitation to Dr Manmohan Singh, Prime Minister of India to attend the 15th SAARC Summit in August to be held in Colombo. The next meeting of the Heads of State and government of the South Asian Association for Regional Cooperation (SAARC) is scheduled to be held from 2 – 3 August, in Sri Lanka. The South Asian Association for Regional Cooperation (SAARC) with almost 1.5 billion people, the combined population of its member states was established on December 8, 1985 by India, Pakistan, Bangladesh, Sri Lanka, Nepal, Maldives and Bhutan. In April 2007, at the Association's 14th summit in India, Afghanistan became its eighth member. SAARC provides a platform for the peoples of South Asia to work together in a spirit of friendship, trust and understanding. It aims to accelerate the process of economic and social development in member states. As the SARC summit is to be held in Colombo, it is a customary practice to deliver invitations in person to all Heads of Government. As India is the current Chair, the first invitation will be delivered to the Indian Prime Minister. During this visit Minister is expected to have bilateral talks with the Indian Minister of External Affairs, Pranab Mukherjee. According to news reports, Indian External Affairs Minister Mukherjee will host a "working lunch" for Bogollogama at the Hyderabad House on Monday. The two leaders will have a detailed discussion on the Sri Lanka situation as well as areas of bilateral cooperation. Mahinda Rajapaksa is a visionary with absolute commitment to the democratic rights and the well being of the people of Sri Lanka. He is determined to work relentlessly to ensure that the people of Sri Lanka – Sinhala, Tamil, Malay and Burgher – live as equal citizens enjoying democratic rights and freedoms in a peaceful and prosperous nation. Addressing the swearing-in ceremony of the new Chief Minister for the Eastern Provincial Council Sivanesathurai Chandrakanthan (Pillayan), President Rajapaksa re-iterated that all stakeholders to the Eastern Provincial Council (EPC) should refrain from cultivating any type of animosity, jealousy and discord. They should work unitedly, in harmony with each other, to realise the true value and potential of the franchise of the people whom they represent, irrespective of their race and creed. “This land belongs to all of us, to the Sinhalese, Muslims and the Tamils, sans any discrimination, to live in harmony. “the President stressed. Although the Provincial Council Administrative System was initially devised for the benefit of the Tamil speaking people of the North and the East, ironically to date, it had failed miserably in its implementation within that region. “Political solutions need not be confined solely to racks and tables or to Constitutions, but they should evolve from the people, the man on the street, and be implemented for their benefit. We are a Government which understands when and where we should legitimately adopt a gun or the political solution policy, as appropriate, to suit the conditions and situations demanded,” President said. “However, today for the first time ever, we have accomplished that arduous task of establishing the Provincial Council, as a remedy and solution to the problems faced by the Tamil-speaking community and also succeeded in electing their own representatives to fulfil their aspirations”, he noted. “Do not think in terms of a Sinhalese, Tamil or Muslim leader, and lead the country to chaos. Let us think as Sri Lankans,” President Rajapaksa added. These words demonstrate President Rajapaksa’s statesmanship, character and vision. The entire Nation now rallies round the Government and the Security Forces to encourage them on the noble mission of liberating the people in the entire Northern peninsula from the scourge of terrorism and restoring democracy. In this crucial time, the democratic and peace-loving world is duty bound to strengthen President Mahinda Rajapaksa. He deserves no less than the Nobel Peace Prize for his relentless endeavor for peace and democracy. A large haul of TNT explosives were recovered yesterday morning around 10.am, concealed in a tea estate in Mahagastota located in Nuwera Eliya. According to a report, this was for the first time; the police have recovered such a huge amount of explosives from upcountry. The Defence sources revealed that, on information received from general public, the Terrorist Investigation Division (TID) of the Sri Lanka Police, recovered TNT explosives weighing 300 kilos, C4 explosives 16 Kilos, 2 numbers of T 56 assault rifles with 2 magazines, and 45 detonators in one of the tea estates in Mahagastota. Sources revealed that the explosives and weapons were recovered from an underground storage in that estate. They further said that the underground storage pit was cemented and covered by cement slab. The TID detectives arrested four suspected LTTE cadres. According to an arrested cadre, the LTTE had dispatched these explosives from Vanni during the Ceasefire period. He added that they were ordered to bury the explosives for future use. Defence sources refused to reveal the name of the tea estate as investigation are still continuing. "The Security Forces are attacking Mullaittiuvu, Prabhakaran's hideout, from several directions. Army's aim is to capture Prabhakaran, who is holed up in a bunker, alive", Army Commander Lieutenant General Sarath Fonseka has stated during an interview with the local daily 'The Dinamina' on Wednesday (June 11). "The 56, 57, 58 and 59 divisions will surge towards Mullaittiuvu and Task Force 2 will also be inducted to the operation" he further stated. Troops are attacking the LTTE's 1-4 Base complex in a preliminary bid to reach Mullaittiuvu. Prabhakaran is believed to be living in an underground bunker in the area. Forces have already regained several hundred square kilometers where the Tigers held sway and they have to march forward another 21 kilometers to achieve the final goals, he has said during the interview. He said Prabhakaran was cowardly attacking civilians in the South, unable to face the military onslaught. The Government and the Security Forces were determined to liberate the Northern masses from the tyranny of the Tigers, as they did in the East. "Our Forces' morale is very high. They are determined to achieve victory," he was further quoted as saying. The Sri Lanka navy outpost at Erukkalampiddi in the Mannar Island has come under a predawn attack by the LTTE terrorists. According to defence sources, a group of LTTE terrorists had come in 6 boats and launched the attack around 2.15 am. The sailors have defended their post effectively causing the terrorists to withdraw with their casualties. According to available information, 4 terrorists including their leader Sirimaran have died in the battle. Also, 3 sailors have been killed and few others wounded during the confrontation. Meanwhile , Sri Lanka Air Force MI 24 helicopters pounded withdrawing terror boats in the Gulf of Mannar . According to the Air Force sources , the air assault has been launched around 4.45 a.m., targeting the terror boats fleeing towards Veddithalthievu area. Defence observers are in the view that the terrorists have carried out this attack with the intention of stopping the people in Wanni escaping to the cleared areas. On 5th June , 13 civilians belonging to 3 families sought refuge from the Navy personnel at the Erukkulampiddi navy detachment. The refugees who resident of Silavanthei in Mullaithivu had told the navy personnel that 1000s are waiting to escape the terror clutches at a given opportunity. Therefore, the terrorist might wanted to remove the closest place of refuge to the Tamil people held hostage in the Wanni, they further said. The Ministry of Education has announced that all Government schools will be closed tomorrow (11) and the day after (12). This decision was taken taking into consideration the risks associated with the teacher trade union action scheduled for tomorrow and the day after. Minister of Higher Education, Susil Premajayantha said that schools will be held on two extra dates in lieu of these two holidays in August. Sri Lanka Air Force launched its second air raid at selected targets on the LTTE forward defence line (FDL) around 3 this evening (June 10). According to Air Force spokesperson Wing Commander Janaka Nanaykkara , the raid was undertaken by fighter jets, following thorough air surveillance. 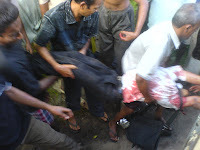 Latest reports from the East confirm that the body of the remaining LTTE suspects has been found with gunshot injuries. Two LTTE suspects were gunned down during a Police and Army combined cordon and search operations at Pallaikudiruppu in Akkaraipatuwa this morning (June 10). According to the defence sources in the area, an armed group of 3 suspects had lobbed two hand grenade at the Police and Army personnel engaged in the search operation around 7 am. A special police team arrested a policeman who is said to have had close dealings with the LTTE suspect Jadheesan Balasubramaniam who was arrested on in connection with the bomb blast on the railway line at Dehiwala last week. The policeman attached to the Wellawatte Police Station is a resident of Kobeigane, in Kurunegala and had very close connections with the LTTE suspect Jadheesan Balasubramaniam, who was arrested by the police at the Irattaperiyakulam in a bus bound for Vavunia last week, Police Headquarters sources said yesterday (9). The policeman had met Jadheesan very often used his motorcycle. It has also been revealed that the policeman had visited Bangkok with a friend some weeks back and the police are investigating his movements to ascertain whether his overseas tour had anything to do with terrorist activities. The special police team questioning the constable at length believes that valuable information could be gathered from the suspect about the activities of the LTTE suspect Jadheesan, who was working as a technician for an air condition equipment company while living at Wattala with his wife, who, too, was arrested. Police also said that they were also investigating the background of the policeman and whether he had any connections with other covert LTTE operatives in the south. The security forces have entered Mullaitievu and they have already taken control of the One Four Base Camp where the LTTE leader at one time was hiding. The forces captured the camp yesterday after the sudden attack. The troops are in complete control of the area. Meanwhile defence sources say the Sri Lanka Air Force attacked a LTTE bunker in the North of Alankumala area in this morning. Air Force Media Spokesman Wing Commander Janaka Nanayakkara says the attack was launched around 11 AM today using MI 24 fighter craft. Air force pilots have confirmed that the attack was successful. The Media Centre for National Security says 17 LTTE terrorists were killed in clashes with the security forces in the past 24 hours in Jaffna, Vavuniya and Welioya. The Army has recovered a corpse of terrorist and several military equipments. Sri Lanka Air Force MI 24 helicopter gunships have raided an LTTE bunker defence located in the North of Alankumala area this morning (June 9). Air Force spokesperson, Wing Commander Janaka Nanayakkara said that air raid has been launched at 11 am in support of troops of 58 divisions. At least 17 terrorists were killed and more than 35 wounded on Sunday (June 8) as Army infantry and armour battalions forced into LTTE bunker positions located North of Janakapura and Kiriibbanwewa at Welioya during a multi-pronged offensive launched since the morning hours. The Katubedde and Polgolla bus attacks blamed on the Liberation Tigers of Tamil Eelam (LTTE) are against all standards of international humanitarian law and all principles on which the United Nations is based, said the UN office for the coordination of Humanitarian Affairs(OCHA). "The targeting of non-combatants is a contravention of international humanitarian law, for which those responsible must be held accountable," OCHA’s news service IRIN quoting a UN official said. The UN humanitarian office said that the United Nations is renewing calls for increased protection of unarmed civilians in accordance with international humanitarian law , in the two bomb attacks targeting civilian buses June 6 eight hours apart , leaving 24 dead and more than 80 injured. 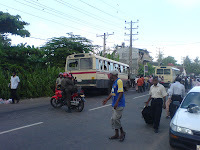 The UN office said, “In the first attack, a bus full of morning commuters was hit at around 7.30am by a Claymore mine-type explosion at Katubedda, a suburb 15km south of the capital, Colombo. Twenty-two people were killed and more than 60 injured in that incident, according to police. “The second bomb, in the rear of a passenger bus in Polgolla town, Kandy District, about 120km from Colombo, left two dead and more than 20 injured. "These attacks on civilians are against all standards of international humanitarian law," Neil Buhne, the UN resident representative and humanitarian coordinator in Sri Lanka, told IRIN. "They are against all principles on which the UN is based." The report added,“The latest two bombings added to the long list of attacks on civilians, especially targeting public transport, since a ceasefire between the Sri Lankan government and the Liberation Tigers of Tamil Eelam (LTTE) broke down on 16 January 2008. “Not counting the latest two attacks, at least 14 others have taken place, most in government-controlled areas, killing more than 200 civilians, according to the UN Office for the Coordination of Humanitarian Affairs (OCHA). The government has blamed the Tamil Tigers for the attacks, while the Tigers have accused teams from the Sri Lankan Army of targeting civilians in areas under LTTE control. Both sides have denied the charges. "The targeting of non-combatants is a contravention of international humanitarian law, for which those responsible must be held accountable," UN Under-Secretary-General for Humanitarian Affairs and Emergency Relief Coordinator John Holmes said in a statement on 29 May. On 27 May, nine civilians were killed and more than 70 injured when a parcel bomb exploded in a packed evening train, south of Colombo. On 24 May, a roadside bomb in LTTE-controlled Kilinochchi District, 250km north of the capital, left 17 civilians dead. "This despicable behavior must stop," Holmes stated. “Buhne said the sentiments expressed by Holmes had become even more relevant and important with the latest attacks. He warned that deliberate attacks on civilians not only hampered humanitarian work in conflict areas, but made innocent civilians too scared to lead normal lives. "What these attacks do is that they make people scared," he said. "There should be a sense of safety for any kind of work to progress, humanitarian or development." Police spokesman SSP Ranjith Gunasekara said 45 suspects (17 University Student) have been arrested on Friday’s bus bomb in Katubedda . "They are under interrogation, he said. Meanwhile Deputy Inspector General of Police Western Province South Division C.D. Wickremarathne said three special teams have been deployed for the investigation activities. Director of the Kalubowila Teaching Hospital Dr. Wilfred Kumarasiri said 21 persons have been killed by the claymore mine attack that targeted a passenger bus at the Piliyandala-Katubedda road. A student of the University of Moratuwa is also among the dead. 55 persons were injured by the incident. Out of them 44 are receiving treatments at the Kalubowila Teaching Hospital. Four persons are in critical condition. 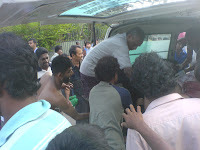 Five more persons have also been to the Colombo General Hospital. Director of the Hospital Dr. Hector Weerasinghe said the five males are receiving treatments in the Intensive Care Unit. DIG C.D. Wickremaratne says three special teams are conducting extensive investigations on Friday bomb blast in Katubedda.Police media spokesman and senior SP Ranjith Gunasekera says a high powered claymore bomb was found hidden in Dehiwela. A micro pistol and bullets were also found. Initially investigations have revealed that a claymore bomb weighing five kilos was blasted using a remote controller. Sri Lanka Air Force supersonic fighter jets have raided an LTTE gathering place located in the Pooneryn area last night, June 6. According to the Air Force spokesperson, Wing Commander Janaka Nanayakkara, the air sorties were carried out around 11.00 p.m. targeting LTTE gathering observed in general area K-Point in Pooneryn. Military spokesperson Brigadier Udaya Nanayakk said to Asian Tribune that the suspect who involved bomb explosion in Polgolla was apprehended by civilians and handed over to police.One Senior Police officer from Kandy said to Asian Tribune that the suspect who had trigged the remote control devise was seen running after the bus and civilians who saw him running, chased, apprehended and hand over him to the police. The identity of the civilian-arrested suspect was not disclosed. Police said investigations are going on.In the meantine Asian Tribune learnt that 20 passengers were onboard at the time of the blast.The bus, bearing number cp HG 7503, was plying from Waththegama to Kandy, and the explosion occurred near the Teachers' Training School in Polgolla. The hospital sources said, 21 people have been killed, 13 males and 8 females, and over 50 injured in this cowardly terror attack. The injured have been rushed to the Teaching Hospital Kalubowila and Base Hospital in Lunawa. Meanwhile, few victims who suffered severe injuries have already been transferred to the National hospital Colombo, Kalubowil hospital sources said. LTTE terrorist have exploded a Claymore bomb targeting a civilian bus(Kottawa to Moth-La) at Katubedda in Moratuwa this morning (June 06). According to the available information 19 civilian have been killed and 40 others have been injured and admit to piliyandala hospital. More information to follow.s and special photos updates shortly. 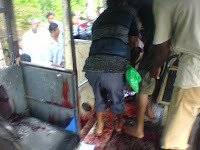 Three people were killed the bomb blast near the University of moratuwa. More than 40 people admit to the piliyandala hospital. Our Special reporter there now. A Claymore bomb blast has been reported near Moratuwa university. Visiting EU-China Friendship Group Secretary General Lin Gai said he will promote Sri Lanka as a destination in China and speaking to media in Colombo Mr.Gai said the friendship group wants to promote relationship in various sectors. Replying to the media he said the Government of Sri Lanka must educate overseas people on Sri Lanka to obtain more tourist arrivals, investments and other opportunities. Mr.Lin Gai said he made his first visit to Sri Lanka and explained his Sri Lankan experience and said Sri Lanka has ideal investment opportunities. "Most of Chinese have funds to invest in various projects. They like to invest in traditional and modern areas, he explained. "Actually I want to help Sri Lanka in various ways .When I am in Brussels I will advise Chinese Embassy to look into these opportunities, he said. Speaking further he said the EU-China Friendship group promotes relationship with China. Recently EU Parliamentarian Nirj Deva had asked EU's support to help earthquake victims in Sichuan province,. China. The EU agreed to provide 6000 tents for them. Nirj also discussed with the Ex-President of the USA Bill Clinton to support China, he said. Speaking on Sri Lanka's conflict he proposed the government must improve social and economic sectors of the un-cleared areas and it would be easy to defeat separatism from Sri Lanka. Mr.Gai said Sri Lanka would become a rich nation within next 10 years. With party nomination a near certainty, Senator Barrack Obama was reportedly looking for a Vice Presidential candidate from among the 28 Democratic governors in the country. He has scheduled a meeting with the governors in Chicago on June 16th according to several news sources. State governors targeted were those where a shift in allegiance from Republican to Democratic was considered highly likely in November this year. Some governors mentioned were: Tom Vilsack of Iowa, Edward Rendell of Pennsylvania, Joe Manchin of West Virginia and Mike Easley of North Carolina. Meanwhile, at least 15 to 25 additional super delegates were expected to endorse Senator Barrack Obama today as the primary season ended in S. Dakota and Montana. Obama was getting closer to the requisite 2,118 delegate number to clinch the nomination, as I write. It looks like the end of the road for Clinton, a 30 year-veteran who has been a political stalwart of stature by her own right. Even though she just missed the nomination she so eagerly craved, people would remember her for the gritty manner she fought. It is a dilemma to confront the endgame; her supporters divide between those who would cede gracefully to Barrack Obama and those who would take the fight to the party convention in August. Most observers believe that she would cede for the sake of the party and its prospects against the Republican candidate John McCain in November. Hers was a feisty campaign; showing resilience and strength of character beyond all doubt. Some believe that in clinging on, she risks bringing what has been a thrilling duel to a scrappy and raucous end in which all the good things about this campaign are forgotten. Both she and Obama deserve to be remembered for a hard fought fight. In retrospect, both candidates made serious errors. While Obama handled the enigmatic race question with sophistication and assurance, he tripped over his turbulent priest Jeremiah Wright. His decision to break not only with the pastor, but also with the church whose congregation he belonged to for 20 years, was probably a necessary step towards electability. But the price paid may take a toll sooner or later. Senator Barrack Obama has effectively clinched the Democratic presidential nomination even if he were to lose both S. Dakota and Montana as many super delegates have just expressed their endorsements of Obama-he may win both primaries tonight. Based on a tally of convention delegates, both pledged and super delegates Obama has exceed the required 2,118 delegate count now. He becomes the first black candidate ever to lead his party into a fall campaign for the White House. He had greater sustaining power than his gamey contender Hillary Clinton who fought to the last primary. Both Obama and Clinton drew historic voter turnout primary after primary. It looked somewhat racially polarizing towards the end as Texas, Pennsylvania, Illinois and Virginia rallied behind Clinton. Obama is certain of getting more than the 2,118 delegates for clinching the party nomination at the Convention in August. The 46-year-old first term senator will face Sen. John McCain of Arizona in the fall campaign to become the 44th president. The anatomy of the Obama win was described as a combination of unstoppable prodigious fundraising, ultra modern organizing skills delivered meticulously and his theme of change that motivated an electorate opposed to the Iraq war and worried about the economy. These were harnessed to his own innate gifts as an orator and a campaigner. According to sources in Kaathankudy 3 members of a Tamil family were hacked to death by the suspected radical Wahhabist Muslim gang yesterday. Tensions between the Tamil and Muslims communities of Kaathankudy are at an all time high. Members of the TMVP and the EROS have made every effort to maintain peace in the area by urging the communities to stay calm until matters are investigated and resolved by the authorities concerned. "The Amparai district is the only area that has remained unaffected by communal violence in these recent weeks said Rasamanickam Yogarasa alias Yogan, the Amparai and Batticaloa District Leader of EROS". A bomb has been exploded in a location along the rail track between Wellawatta and Dehiwala railway stations this morning, June 04. According to the available information explosion occurred around 7.10 a.m and six civilians who suffered injuries are now being evacuated to the Kalubowila teaching hospital. An explosion has been reported in Wellawatta area. The National Disaster Relief Services Centre says so far 19 persons have died in the floods and four others are missing. The government has so far allocated 29 million rupees to assist persons affected by floods and torrential rains. Director of the National Disaster Relief Services Centre N.D. Hettiarachchi said that the highest allocation of 12 million rupees is for the Ratnapura district. The number of families affected by flood and landslides has mounted to 82,420. The highest number of affected persons is reported from the Kalutara district. Additional District Secretary L.C. Perera said low lying areas are still underwater. Boat services are operating to assist the affected people. Irrigation Engineer of Kalutara W.N. Silva said the water level of the Kalu Ganga has risen to 6.9 feet. As a result the flood situation in Kalutara will escalate. Meanwhile, in the Ratnapura district both floods and landslides have affected families. Officials of the National Building Research Institute are engaged in identifying landslide prone areas. The highest number of displaced persons in the Kegalle district is reported from the Dehiowita Divisional Secretariat area. The JVP said the UNP has no right to launch a protest campaign against current fuel crisis in Sri Lanka and said the UNP was responsible the present fuel crisis .General Secretary of the JVP Tylwin Silva said the UNP had closed government owned fuel related businesses during their regime. They also introduced open economy which brings worst results for the local businesses and industries. Speaking at a media briefing held in Colombo on Monday he said JVP would launch an agitation campaign against the current fuel crisis.Replying media he said the JVP ready to face any kind of election in any time. "We will organize a common collation to defeat opponents .We never join with the UNP but looking a partnership with progressive patriotic allies, he said. Meanwhile the United National Party says they have decided to launch a protest campaign against the unreasonable fuel hike by the government from tomorrow. Last week UNPers rode a group of bullock cart to show their protest against the latest escalation in fuel prices. The bullock carts wound their way from Colombo Fort Railway Station to Pettah, Maradana and to the Lipton Circus, where a protest rally took place. Speaking to the media UNP General Secretary Tissa Attanayake said they would travel to Parliament by bullock cart to protest the unprecedented fuel price hike. The meeting between Sri Lanka and United States at the sixth US-Sri Lanka Trade and investment Framework Agreement Council meeting held in Washington deepened both countries’ commitment to expand bilateral trade and investment said John K. Veroneau. The US delegation was led by Deputy US Trade Representative John K. Veroneau. Gamini Lakshman (G.L.) Peiris, Minister for Export Development and International Trade, led the Sri Lankan delegation. U.S. and Sri Lankan officials reviewed progress in addressing bilateral trade and investment issues identified at the last TIFA Council meeting in November 2006, including common interests on which the two countries can work together to facilitate expanded trade and cooperation. They discussed the status of the ongoing WTO/Doha negotiations, Sri Lanka’s use of the U.S. Generalized System of Preferences (GSP) program, and U.S. trade capacity building assistance to Sri Lanka. In addition, the TIFA Council discussed issues affecting U.S. exports, such as Sri Lanka’s agricultural biotechnology policies, import tariffs, intellectual property rights protection, and transparency in government procurement. On July 2, 2002, the United States and Sri Lanka signed a Trade and Investment Framework Agreement (TIFA) that provides a forum for both countries to examine ways to expand bilateral trade and investment. The TIFA Council facilitates an ongoing dialogue to identify and works to remove impediments to trade and investment flows between the two nations. Total two-way trade between Sri Lanka and the United States totaled $2.3 billion in 2007, with U.S. imports of $2.2 billion and U.S. exports of $227 million. The leading U.S. exports to Sri Lanka were cereals (wheat and maize), electrical machinery, optical and medical instruments, and plastics. U.S. imports from Sri Lanka are primarily apparel, rubber, precious stones, and machinery. In 2007, U.S. imports from Sri Lanka qualifying for GSP provisions were valued at $153 million. The Sri Lankan Defence Ministry claimed here that on the basis of “intelligence reports” on Monday that senior LTTE leader Seevaratnam Prabaharan alias Pulidevan is under “house arrest on charges of treachery” against the outfit. To buttress its claim, the Ministry said Mr. Pulidevan was not seen at the funeral of Balraj, a senior LTTE leader who died of a heart attack recently. There was no response from the Tigers to the claim. Usually the LTTE does not respond to the military’s claims on the ground situation and suggestions of “power struggle” within the outfit. Mr. Pulidevan is the chief of “LTTE Peace Secretariat,” a body created after the recently abrogated 2002 Cease Fire Agreement (CFA) between the government and the Tigers, and was also a member of the LTTE negotiating team in the peace talks.